Our neighbors across the street recently sold their house. 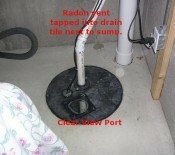 Right before the sale I noticed a white pipe and fan pop through their wall as a result of the final inspection and radon test. "We've probably got a radon issue in our house too", I thought. I bought a Pro Series 3 radon detector. After a couple days my concern was confirmed, and after about a month we had a 30-day average reading of 10.5 give or take, with a peak of close to 13. In the meantime I was doing research on the web, at EPA's website, and other places. The best resource I found on how a homeowner can put in a mitigation system is this website. 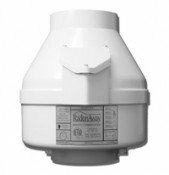 I purchased a fan, condensate bypass kit, sump cover, fittings, and other items from Indoor Air Health Advisor. They arrived within days. If it wasn't for this website, I'm not sure where I would have purchased some of the components. I chose to install our system as a cover to our existing sump and exhaust it outdoors. Since I was sealing up the sump for the radon mitigation system, I took the opportunity to change out our sump pump, install a battery backed sump pump in case the first pump failed, and put in some new check valves. The entire project (two sump pumps, battery, radon mitigation) took the better part of two weekends, and I had to purchase quite a few new tools (hole saws are essential for cutting holes in the sump cover for your pipes and cables), but it turned out well. Most importantly, since I flipped the switch and turned the fan on last Sunday, the 7-day rolling average has dropped over a point every day and now sits at 1.2, down from 10.5. I expect given another week or two I'll consistently have readings below 1. The system has worked great, and I've got peace of mind for my family since we plan to live in this house for decades to come. Thanks for your website, it was a great help to me in designing, procuring, and installing my system.